Last month in a piece for ESPN Insider, I was tasked with predicting what players might benefit from a change of scenery. In that piece, this author cited a 2016 paper titled “Turning up by Turning Over” published in the Journal of Business Psychology, which studied 712 players who changed teams in the major leagues from 2004 to -15. The study concluded there are benefits for certain players in changing teams, particularly players that had been in decline. The study asserted there is a real change-of-scenery effect. Maybe this effect is really just regression to the mean, teams acquiring players after down years. But there is perhaps something to be said for the energy and clean slate of a new environment. There’s also something to be said for being exposed to new ideas and colleagues. While Craig Edwards noted earlier today that the Pirates may have a new emerging ace, their former No. 1, Gerrit Cole, was one of the players I included in my piece about changes of scenery. I wasn’t alone in the belief, as many suspected, that he could benefit by moving to Houston. And through two starts, the Astros, a team with an overwhelming collection of talent and a 100-win projection, look like they might be developing the last thing the rest of the American League wanted to see: another front-line pitcher. Every piece of analysis is attached with a small-sample-size disclaimer this time of year, which can make evaluation difficult. 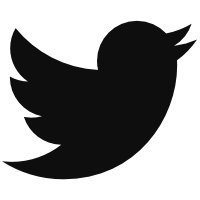 When do you make something of a small sample and when do you ignore it? But through two starts — dominant efforts against the Rangers and Padres — Cole has pitched like an ace. After an uneven run in Pittsburgh, Cole struck out 11 batters in each of his first two starts in Houston. He’s never strung back-to-back, double-digit strikeout efforts together in his career. He has only eight double-digit strikeout efforts since he debuted in June of 2013. These starts grab our attention. Back before Cole was officially an Astro, this author noted how the move to the Astros could be beneficial. In short, Cole has been one of the most fastball-dominant pitchers in the game. The Pirates remained one of the most dominant fastball teams last season. I recently wrote about the The Pirates’ Way in the era of launch angle. Pittsburgh led baseball in fastball usage last season at 62.8%, while the Astros ranked 27th at 49.6%, one of five teams below the 50% threshold. The Pirates employed the approach to great success from 2013 to -15, but perhaps hitters now geared to the fastball, particularly the low, sinking fastball, be presenting problems? Moreover, while some pitchers are well-served to lean on a single pitch like the fastball, Cole had developed a fastball problem. Although Cole has had one of the top fastball velocities in pro baseball since being drafted No. 1 overall out of UCLA in 2011, hitters began to catch up and turn on his 96-mph fastball velocity in recent seasons, particularly this most recent one. Cole allowed 19 home runs on his four- and two-seamers in 2017, compared to five and seven the previous two years. Batters pulled 91 air balls against him last year, posting an .853 wOBA to the pull field, both career-worst numbers by some distance. Batters are becoming better fastball hunters, as Cole can attest. Maybe Cole would have adjusted away from his fastball with the Pirates, but moving to the Astros — where his former Pirates teammate Charlie Morton turned around his career — hasn’t hurt. As you might expect, Cole has thrown his fastball less often, and his breaking stuff more frequently, as he has enjoyed back-to-back starts with 21 and 19 swinging strikes — the best and second-best marks of his career. Cole’s fastball usage is down from 60.1% last season to 54.9% through two starts. And he’s essentially shelved his two-seam fastball, which ranked as a below-average pitch the last two seasons per linear weights. He’s thrown his slider or curveball on 39.7% of his offerings. Cole rarely leaned on spin this much in his career. He’s thrown his slider on a quarter of his offerings, and the only year when he has thrown it more than 20% of the time was in 2015 when he finished fifth in NL Cy Young voting. And of course it’s not just usage, but location. 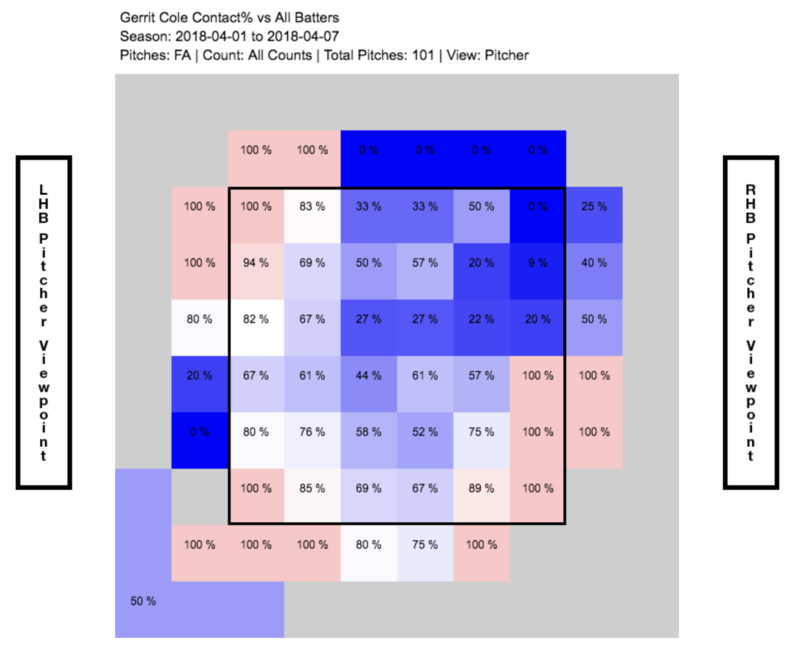 Cole is consistently getting the ball under swings and burying the slider and curveball on the back feet of lefties as he did in that successful campaign. 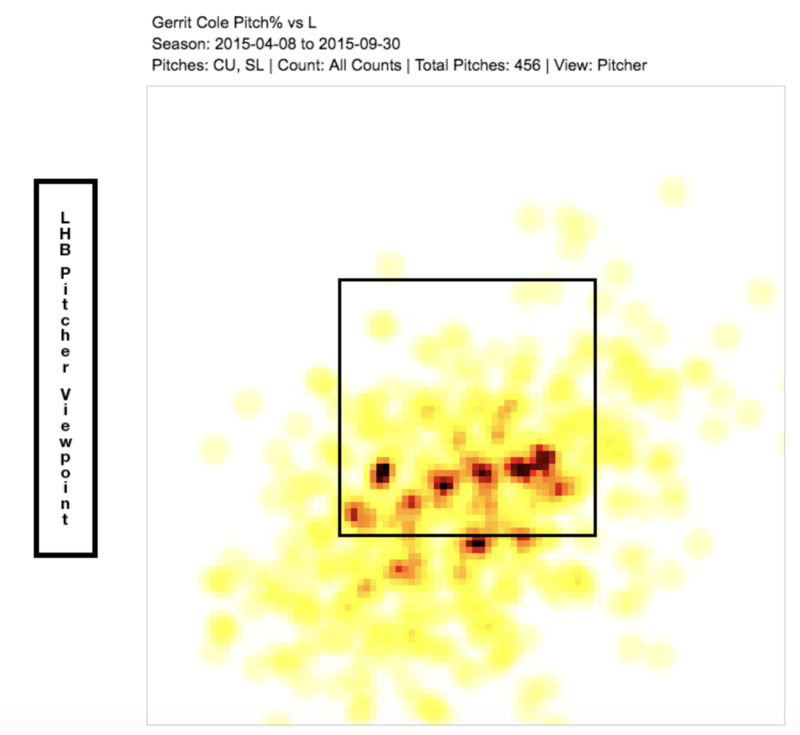 Lefties crushed Cole last season to the tune of a .335 wOBA while righties posted a .297 mark. 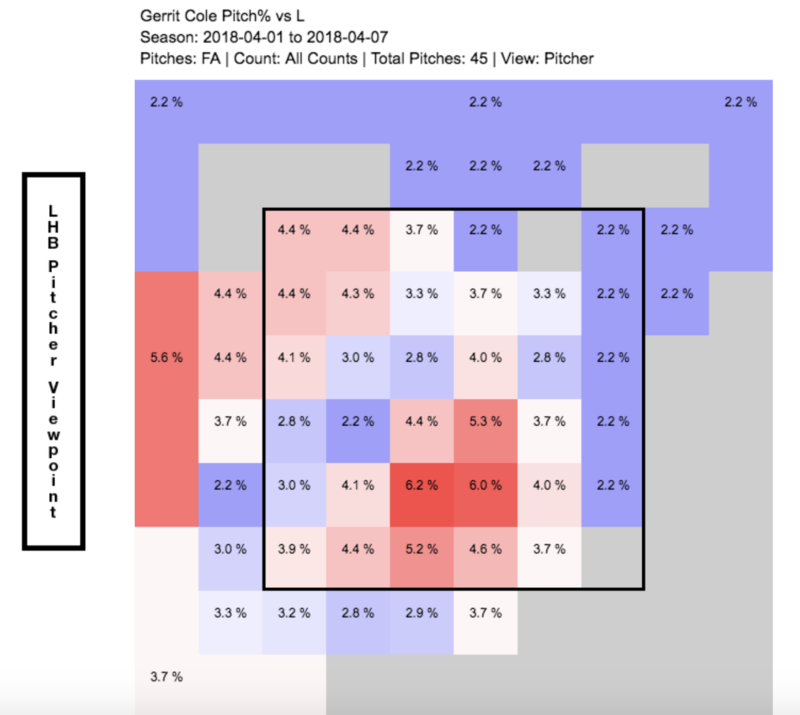 In 2015, when Cole had excellent command of his breaking balls, he had reverse splits: lefties posted a .268 wOBA and while righties were at .283. In 2015, more of his breaking pitches were concentrated down. Cole missed more often up with his breaking stuff last year. Consider this back-foot slider against Cory Spangenberg on Saturday. 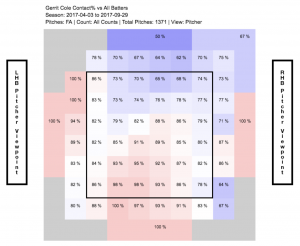 His early success is not just tied to more breaking-ball usage — perhaps giving opponents more uncertainty — but Cole appears to have a better feel for spin and is getting the curve and slider lower in the zone. 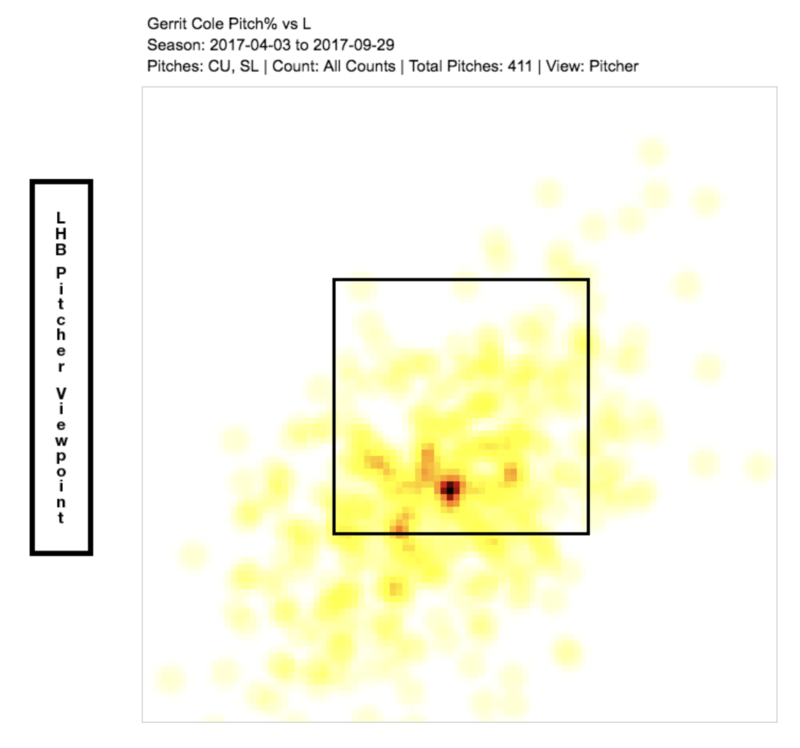 Cole might be wise to lean even more upon his breaking stuff, but his early fastball performance is even more interesting. Two starts is a very small sample. It’s about 7% of a 30-start season. But Cole’s fastball is doing some interesting things. His 41.3% whiff rate on his four-seam fastball (101 thrown) trails only David Price amongst starting pitchers, according to BP’s PITCHf/x leaderboards. Cole’s fastball was crushed last season. In two starts this year, it’s been a devastating swing-and-miss offering. While the prudent take might be to just simply let the sample grow before writing or saying anything, Cole’s fastball has demonstrated an interesting change: it has more spin and vertical movement. H-Move and V-Move presented in inches. Increasing fastball spin is supposed to be difficult, if not impossible, for most pitchers. Cole had slightly below-average spin on his fastball from 2015 to -17, which might explain in part why the pitch had often been hit well despite its elite velocity. Maybe that spin is why scouts described Cole’s fastball as “flat” coming out of UCLA. 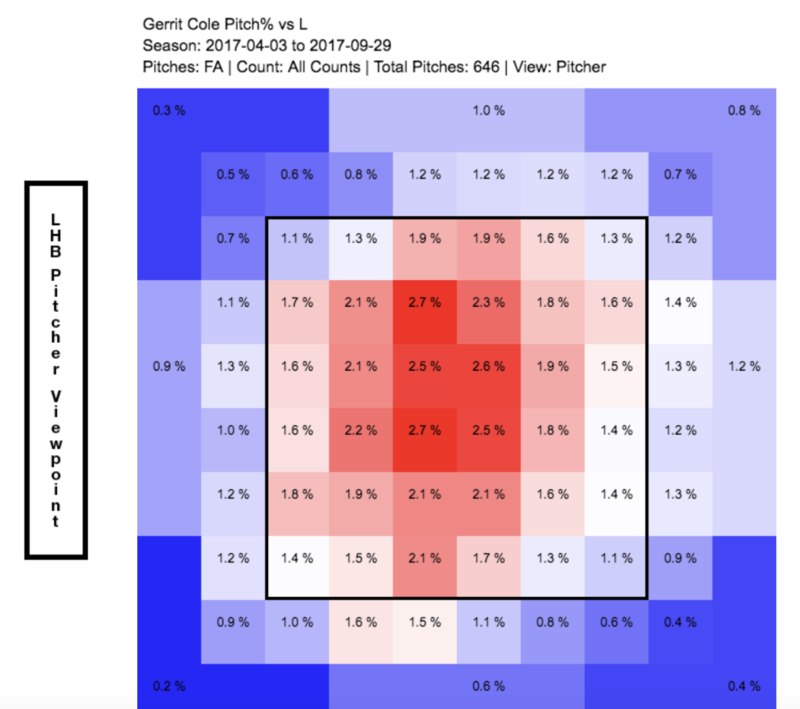 Maybe Statcast had been including some lower-spin two-seamers, a pitch Cole has largely shelved. But what if he has somehow changed the nature of his four-seamer? That sounds like Hinch is seeing a fastball with greater spin and more rise. The spin increase is something worth keeping an eye on. While the Padres aren’t exactly the 1927 Yankees, the change in his contact percentage on his fastball is interesting. Yes, it’s just a small sample, but it’s also a sample of Cole as good as we’ve ever seen him. The Astros didn’t surrender any of their top assets to acquire Cole. The worst case scenario was they would acquire a mid-rotation arm. The best case scenario was the Astros would get more out of Cole — or he would begin to figure out things on his own — and they would enjoy an ace. The rich might have just become richer. If Cole has reached another level, the Astros might have the best rotation in the game. The Astros might have the best of everything. We hoped you liked reading The Astros May Have Another Ace by Travis Sawchik! I was waiting for this article ever since I saw the “Taillon is as good as Cole” article earlier today. What an insane rotation. If he stays healthy (an enormous “if” with Cole) then that trade is going to go down as one of the biggest heists in recent memory. Astros only have Cole for 2 years. Moran and Musgrove should provide a enough WAR (though spread out over a lot of years) to keep this out of the biggest heists. I would guess that the relative importance of the clause “spread out over a lot of years” determines what a given person thinks of this trade. I think it’s very important, but others might not. There is added value in WAR today over WAR in the future. Musgrove and Moran though are projected to produce enough WAR to cover what Cole does factoring in typical inflation. To me , the question comes down to whether or not one believes that there is more or less a finite amount of WAR such that WAR and value have a linear relation except close to zero WAR (i.e., when the error in the calculation of replacement level is greater than the value of the player). Even then, there are enough deals with guys that bust, that this deal shouldn’t be the biggest heist unless Moran and Musgrove bust. There is added value in having WAR in one player in one season compared to it being spread out over multiple seasons/players. How much value? Like I said, that’s going to color how you view this trade. Having consolidated WAR does not lead to more wins as WAR is more or less finite. A team can’t just snap its fingers to fill roster spots with guys that produce positive WAR. Being able to get more WAR on the field in competitive years is what matters. There are very rare circumstances when a team has so much potential WAR that it needs to consolidate. Teams should value becoming World Series contenders (i.e., total WAR especially in competitive years) more than worrying about the problem that they could become a World Series contender that has more potential WAR than they can put on the field. Consolidated WAR is more an issue for teams like the Yankees and Dodgers that know they can fill out a roster year after year based on their payroll. The Pirates are not one of those teams. Granted, I see this as a difference of opinion. Not for a losing team. Not that I expect the Astros to lose. Don’t forget Michael Feliz. Could definitely be a guy worth a win per season. 6 WAR in one roster spot spread over two years is significantly more valuable than 6 WAR in two roster spots spread over six years. This this this…so much this. Maybe not a total heist, but Moran (with an impressive first 24 games in MLB, over three years) looks like a lottery ticket to me. Low floor, high ceiling. Musgrove’s 170 IP don’t stand out much, although the K/BB ratio is decent. Maybe a mid-rotation starter. Not yet a work-horse. It’s definitely a trade that works for both teams, so not really a heist, but I think the Astros gave up four players they couldn’t easily fit into their roster, in return for a guy whose trade price was sky-high (for whatever reason) a year or so ago. I’ll take the over on the comparative WAR value, even being limited to two years. Even if he stays healthy and the Pirates’ 12 years of team control return flames out, it’s still not even close to half a season of Scott Feldman and Steve Clevenger for 4.5 years of Arrieta and 5.5 seasons of Pedro Strop.